Secrets are sweeter when you spill them on the pages of this gorgeous mini writing set, packed with tempting goodies of all kinds. In adorable ice cream colours, it’s full of teeny-weeny treats that let you surprise friends with cute-as-candy greetings. Pretty paper for notes and messages, with cupcakes in the corner – and pink decorated envelopes to slip them into. Colourful stickers, and the cutest sticky notepads for writing all your memos onto. 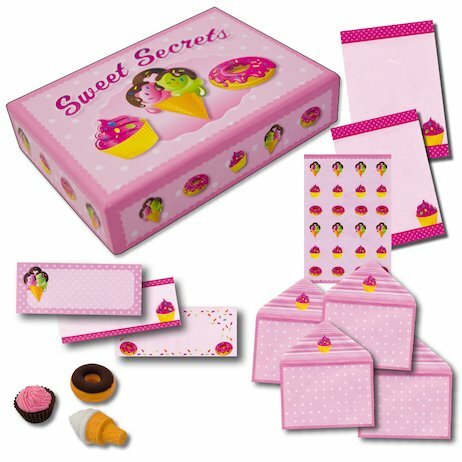 Plus three tiny sweetie erasers – a cupcake, a doughnut and an ice-cream cone – guaranteed to be the dinkiest you’ll ever use or see! Stationery can’t come any sweeter! Contents: mini box with 20 sheets of paper, 10 envelopes, sticker sheet, 3 mini sticky notepads and 3 sweetie erasers. This is the cutest stationary box ever! i got it from school and i had to wait for a long time. The day they ordered them, we thought they had arrived so we acted like we were going to disneyland for nothing! This looks really cool!I REALLY like the rubbers!They look so cute!I first thought that the cake was real! !I’d feel like eating it if it was real!